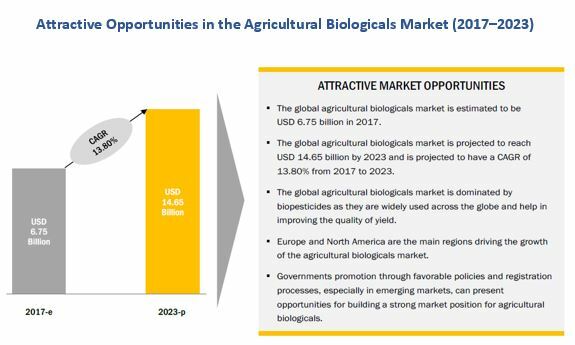 [177 Pages Report] The agricultural biologicals market was valued at USD 6.00 Billion in 2016 and is projected to reach 14.65 Billion by 2023, growing at a CAGR of 13.80% from 2017. Secondary research was conducted to determine the value of each subcategory identified in the agricultural biological industry for regions such as North America, Europe, Asia Pacific, and RoW. The key players have been identified through secondary sources such as the Food and Agriculture Organization (FAO), the US Department of Agriculture (USDA), Eurostat (EU Database), the United States Environmental Protection Agency (EPA), and the Food and Agriculture Organization (FAO), while their market share in respective regions has been determined through both primary and secondary research. 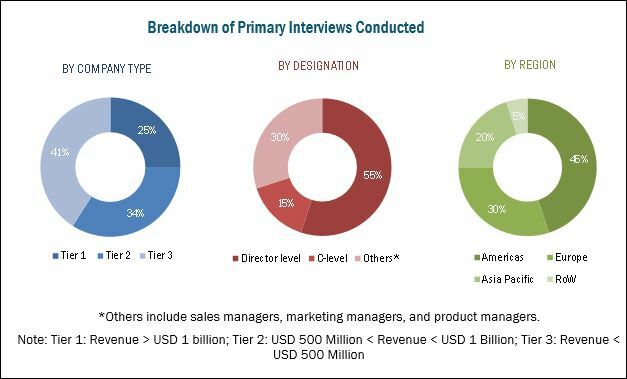 The research methodology includes the study of annual and financial reports of the top market players as well as interviews with industry experts (such as CEOs, VPs, directors, and marketing executives) for key insights (both quantitative and qualitative) about this market. The various contributors involved in the value chain of the agricultural biologicals include raw material suppliers, R&D institutes, crop protection companies and plant biotechnology such as Bayer, Syngenta, BASF, Monsanto BioAg, and government bodies & industry associations such as US Department of Agriculture (USDA), European Biostimulants Industry Council (EBIC), Biostimulant Coalition, International Federation of Organic Agriculture Movements (IFOAM), International Seed Federation (ISF), and the American Seed Trade Association (ASTA). 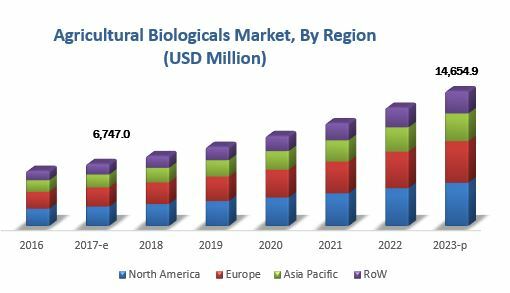 The agricultural biologicals market is projected to grow at a CAGR of 13.80% to reach USD 14.65 Billion by 2023 from USD 6.75 Billion in 2017. The role of agricultural biological products has become a part of integrated pest management practices (IPM) in developed markets, wherein the biological products are used in combination with new synthetic crop chemistries. North America accounted for the largest share in 2016, while Europe is projected to be fastest-growing in the biopesticides market over the next six years. Biopesticides are expected to be a potential substitute for synthetic pesticides in Europe due to the growing regulations on chemical usage and maximum residue levels (MRLs). The ban on the use of important pesticides in the global market such as neonicotinoids, glyphosate, and paraquat is expected to drive the growth of the European biopesticides industry. The global market for biostimulants is projected to gain strong growth during the forecast period due to their indispensable properties such as activating plant physiology, stimulating soil microbial function, and adjusting nutrients and pH in the rhizosphere. Europe is expected to lead this market, followed by the Asia Pacific and North America, throughout the study period. The biofertilizers market has been gaining significant interest across most regions of the world. Growth in the organics industry, rise in the cost of chemical fertilizers, and increasing awareness of soil replenishment are the major drivers of this market. Biological seed treatment is projected to develop into a very important product category in the next six years. Biological seed treatment across the globe is expected to gain momentum as it provides environmental tolerance to seedlings and helps in yield maximization, which encourages the farmer to adopt these products. The major restraining factor affecting the top 10 trends in the agricultural biologicals industry is the efficacy issues of agricultural biologicals as compared to chemical-based counterparts along with the shelf-life issues of agricultural biological products. Moreover, the adoption of new agricultural practices by farmers depends on factors such as practical viability, economic sustainability, eco-friendliness, and more importantly, government support. BASF (Germany), Bayer CropScience (Germany), Monsanto BioAg (US), Valent BioSciences (US), Marrone Bio Innovations (US), Koppert (Netherlands), and Certis USA (US) are some of the prominent players in the agricultural biologicals industry that focus on expanding their product portfolio and geographic outreach to cater to the huge customer base to develop new products. These players’ core competencies have been their diverse product portfolios that include biopesticides and biostimulants.